Red SofHyde Human Touch Opus 3D Massage Chair Zero Gravity Recliner with Heat - We all need an escape from the stresses of daily life. 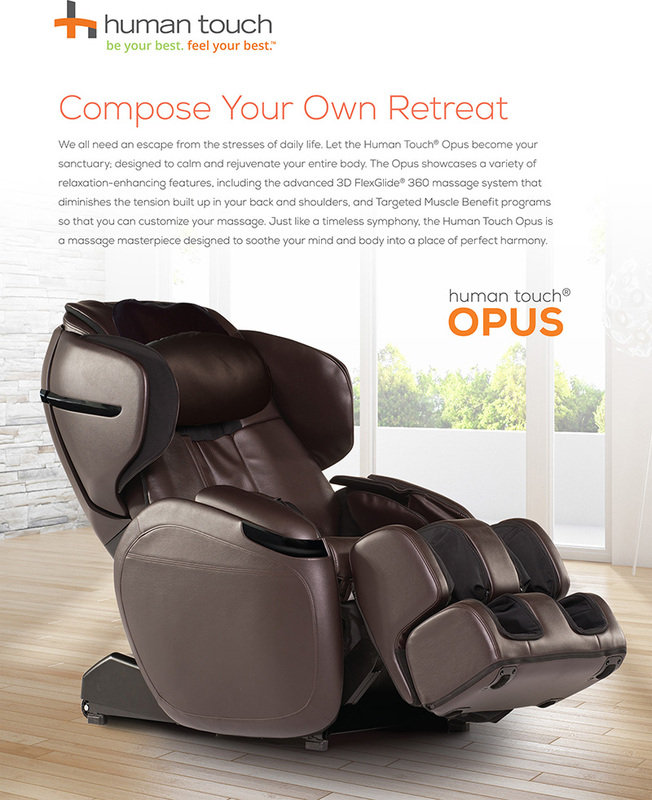 Let the Human Touch® Opus become your sanctuary; designed to calm and rejuvenate your entire body. 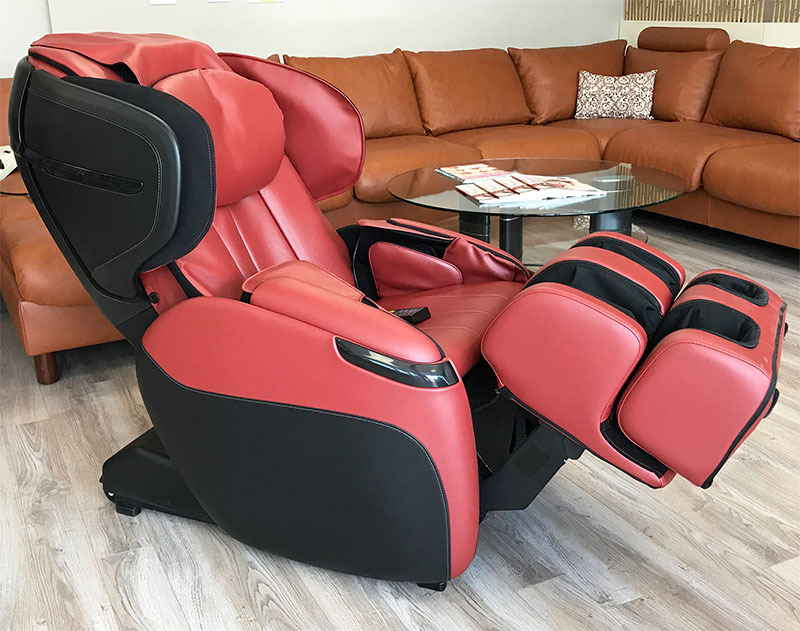 The Opus showcases a variety of relaxation-enhancing features, including the advanced 3D FlexGlide 360 massage system that diminishes the tension built up in your back and shoulders, and Targeted Muscle Benefit programs so that you can customize your massage. 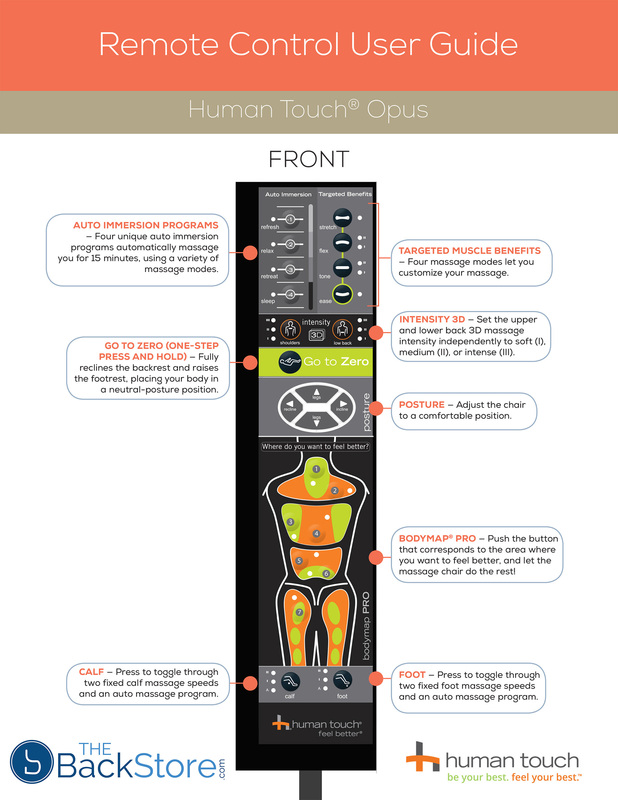 Just like a timeless symphony, the Human Touch Opus is a massage masterpiece designed to soothe your mind and body into a place of perfect harmony. Real rollers for the bottom of your feet to provode a vigorous foot massage. The Opus is available in Black, Espresso, Red and Bone. 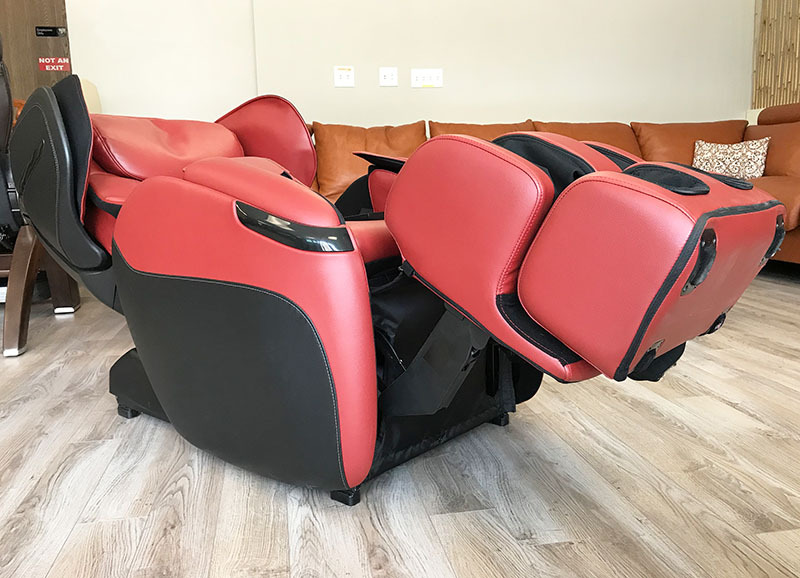 3D FlexGlide® 360 Massage Engine - Free from the pinching and friction associated with typical massage chairs, 3D FlexGlide 360 technology offers seamless glide to help you bask in the glow of ultimate relaxation. 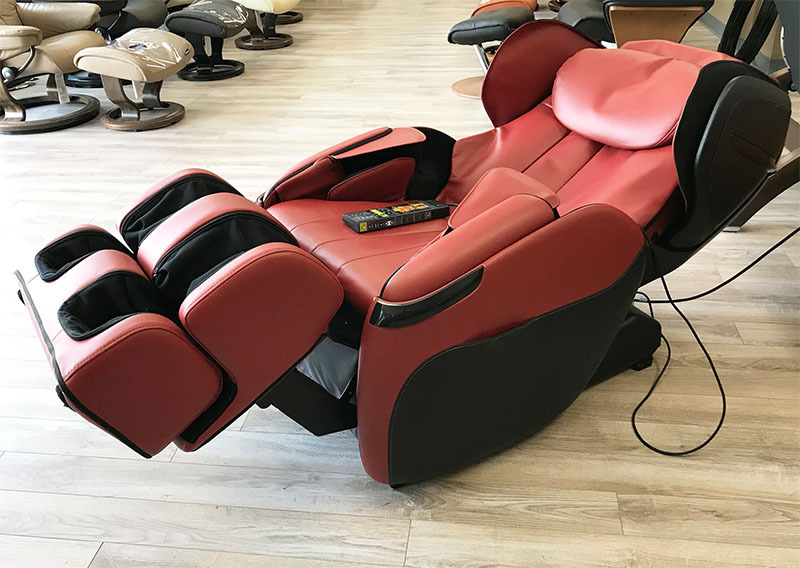 Extendable, Fully-Encompassing Foot and Calf Massager - The fully-encompasing foot and calf massager with proprietary Figure-Eight Technology helps push the blood flow in an upward motion to improve circulation, while under-foot rollers provide a reflexology massage. Under Foot Massage Rollers - Real rollers for the bottom of your feet to provode a vigorous foot massage. 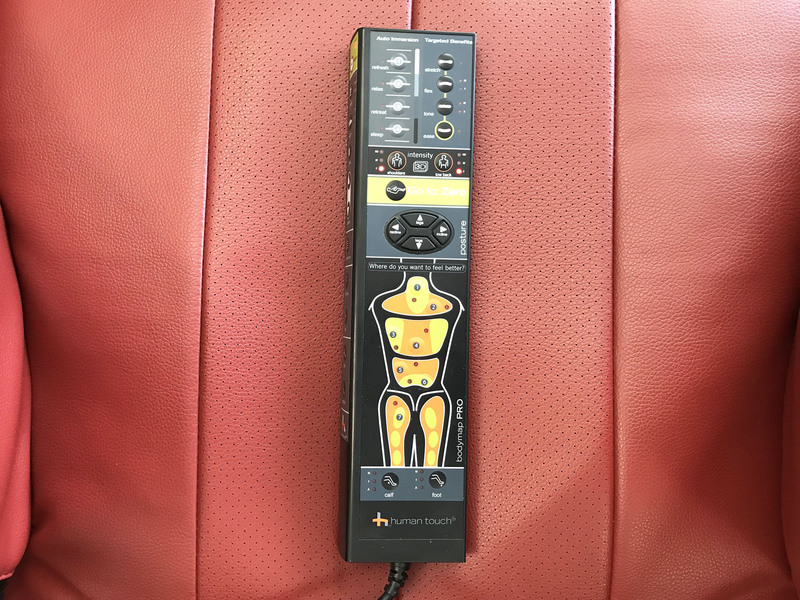 AcuPoint® Detection - Measures the entire length of your back and the contours of your neck and shoulders, mapping key pressure points to target during your personalized massage. 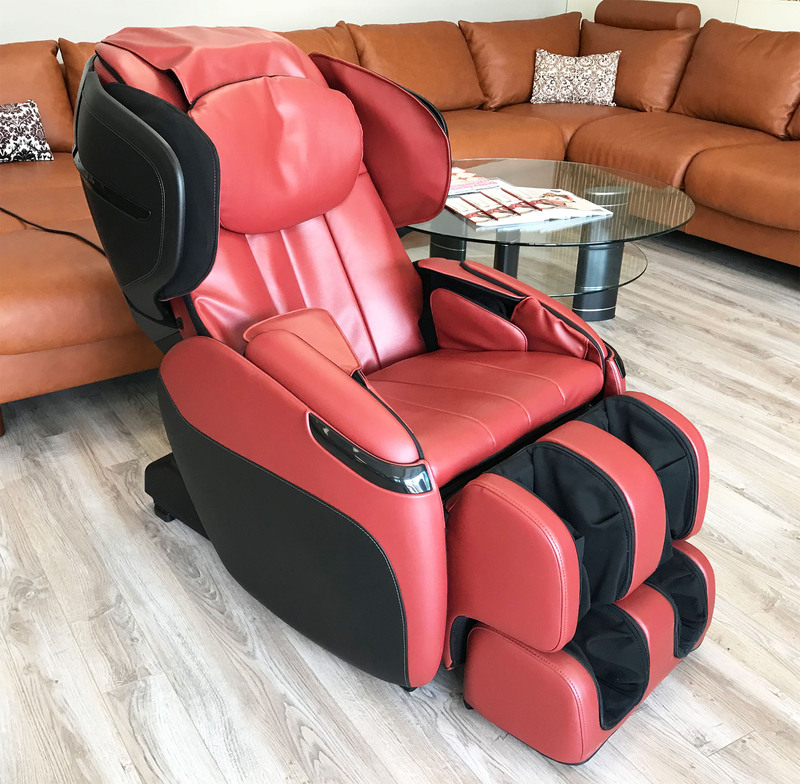 Easy Sleeves® Washable Covers - The sleeves of the foot and calf massager are removable and machine-washable for ultimate convenience and cleanliness. 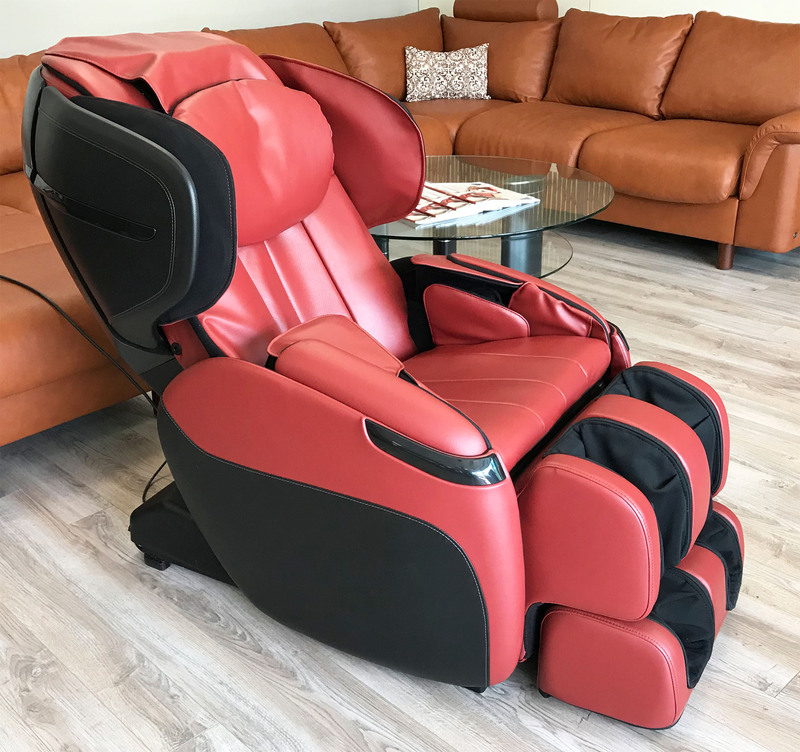 Cloud Touch Acupressure - Strategically placed targeted aircells apply pressure to key healing points and manipulate your body to stretch muscles. 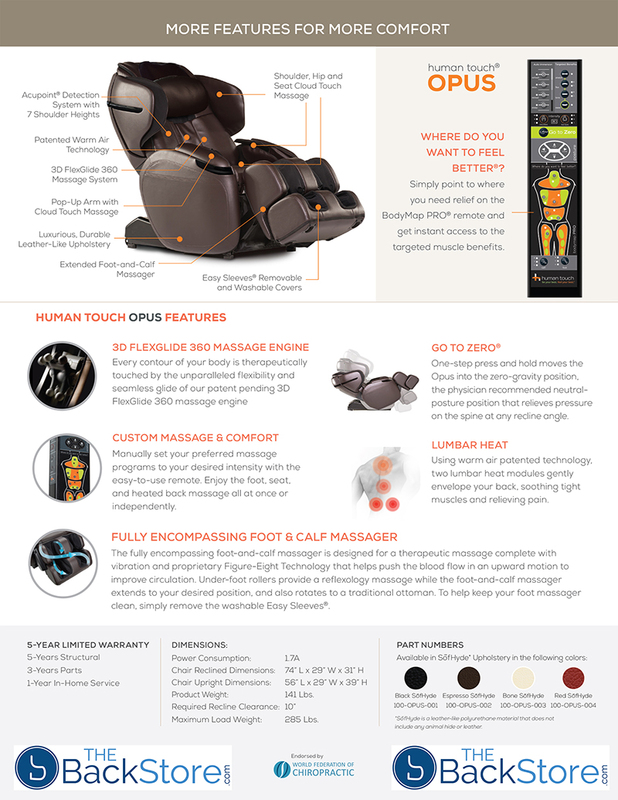 One-Step Go To Zero® Control - Enable Zero-Gravity with just the touch of a button, and you'll automatically be moved to an optimized neutral posture position for a more soothing and refreshing massage experience. 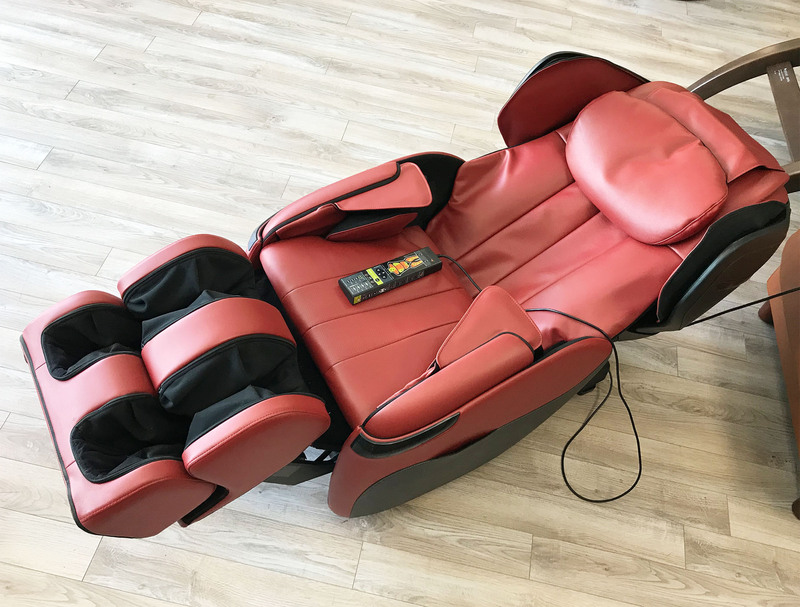 Warm Air Technology® Lumbar Heat - Using Human Touch Warm Air Technology®, heat flows continually to target the lumbar area, gently soothing tight muscles and relieving pain. 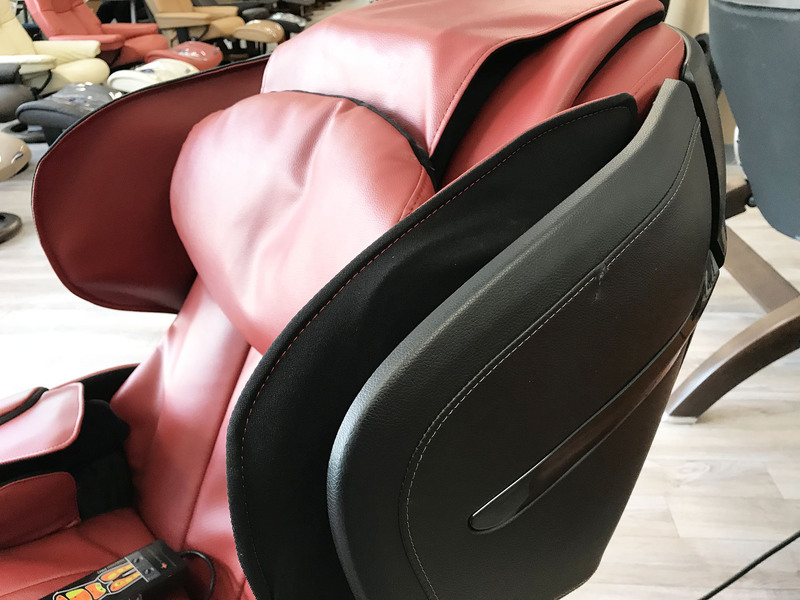 Factory Warranty - New Chairs include a 5 Year Structural Warranty, 3 Years Parts and One Year In-Home Service. Refurbished Warranty - Refurbished Chairs include a 90 day parts only warranty. Shipping - Standard Freight Ground Curbside shipping is included to most addresses in the lower 48 states. 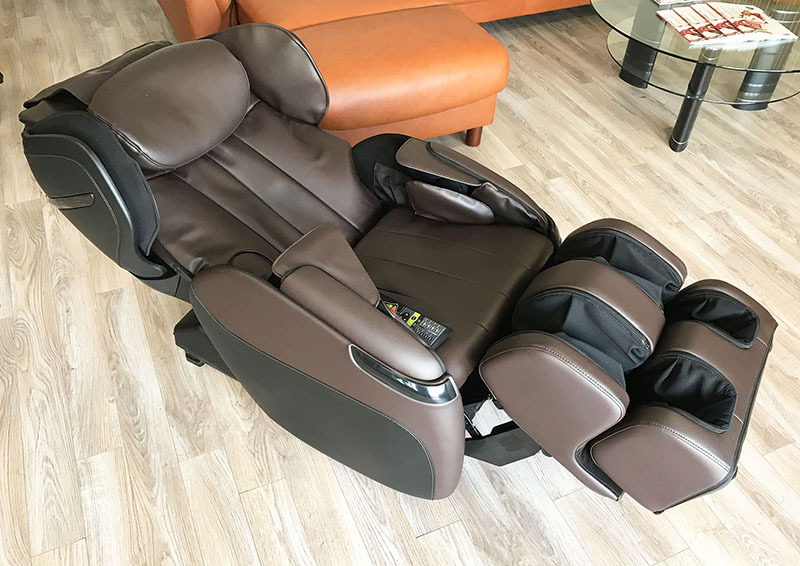 Calf Massage Width - 4.5"
Calf Massage Height - 15"
Reclined Clearance Required (distance to wall) is 10"
*WARRANTY INFORMATION: New Human Touch Opus 3D Massage Chair Recliners have a 5/3/1 Year Factory Limited Warranty. 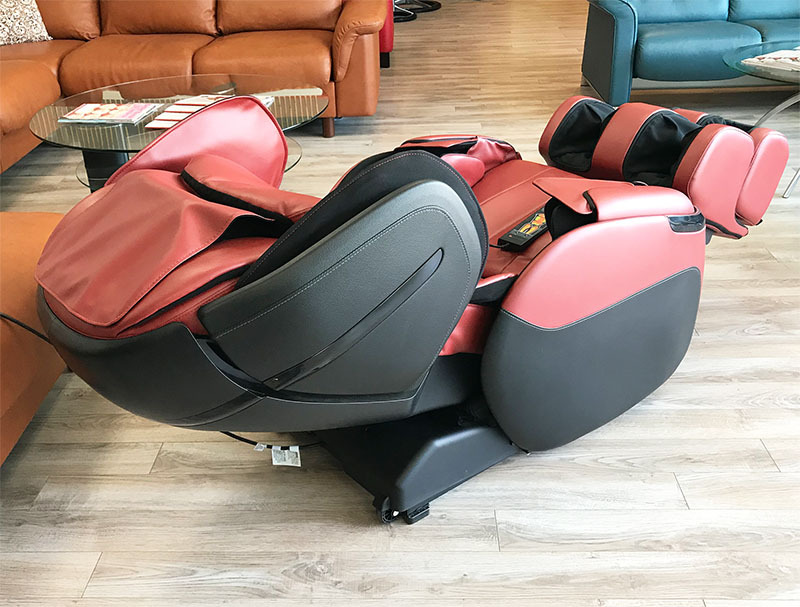 The New Opus massage chairs come with a manufacturer's five-year limited warranty against Structural defects (Frame only - cosmetics are not covered). Parts are covered for three years from the original date of purchase. 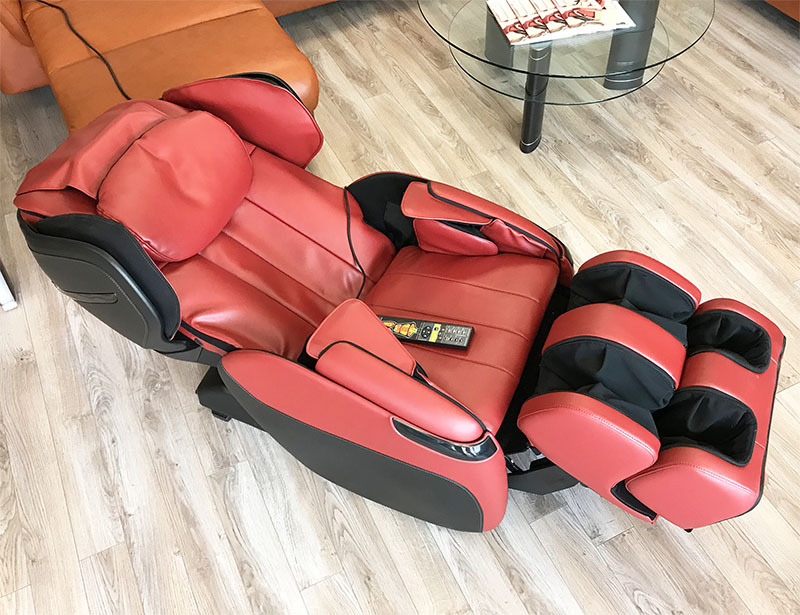 In Home Factory Service (All 50 US states and most major cities in Canada) is covered for one year from the date of purchase and can be extended with an extended warranty. 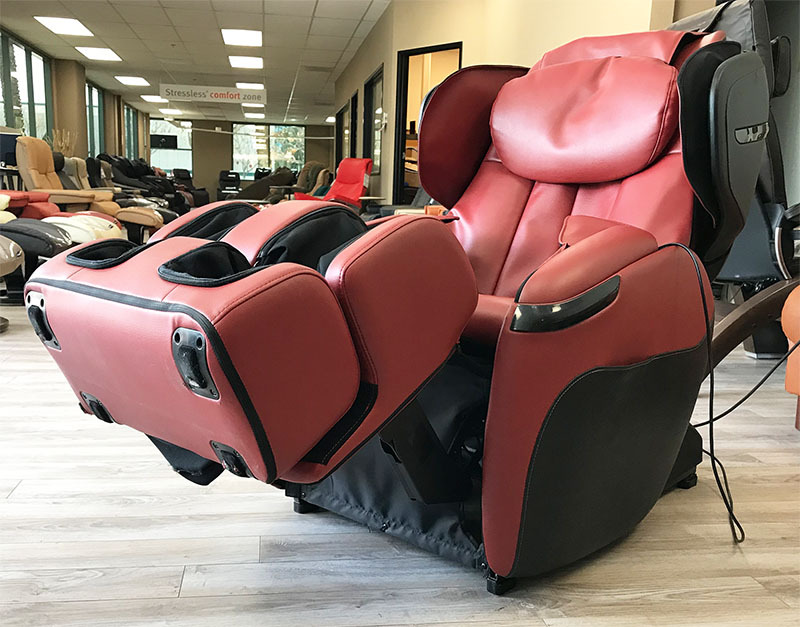 Refurbished Massage Chairs have a 90 Day limited warranty for parts only. Chairs are packed for shipping and require minor assembly. Warranty is not valid for chairs shipped out of the United States and Canada. In-Home Service is only available in the US 50 states and most major Canadian Cities. 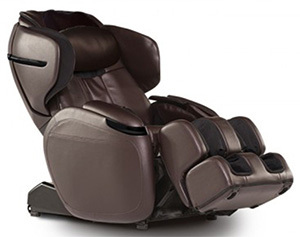 Extended warranties are available on both New and Refurbished Massage Chairs. More Detailed Human Touch Warranty Information here.